In time for the holidays! The A.C.M.E. carbide-tipped Fruitcake cutting bandsaw blade! That holiday fruitcake can be a tasty treat if it is sliced thinly and soaked in rum for a while. The problem is that before it's soaked it's impossible to cut, and afterward it's too flammable to use with power tools. That's the dilema the A.C.M.E. Carbide Fruitcake Cutter was designed to solve! Made in a range of lengths to fit most common bandsaws and a few electric carving knives, this blade makes short work of almost any friutcake, even the one Aunt Ethyl sent you last year (and several years before that)! The hand-honed teeth are hard enough to withstand almost any combination of citron, nuts, and flours, and sharp enough to slice the densest recipes. They are carefully welded to a super-tough, flexible, High-Speed Stainless Steel Alloy blade that won't wear out even after hours of hard use. We even had it bronze anodized to match your 50's retro kitchen appliances. The blade is polished to a perfect shine that repels any sort of sticky cherry or fig residue. Now you don't have to feel guilty, disposing of that well-meant gift fruitcake that has been passed down through generations, and you can clear out all the ones on the back shelf that have been stored since the presidency of Johnson*. Give the A.C.M.E. 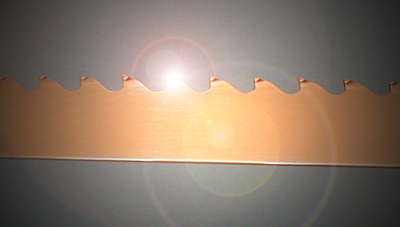 Fruitcake Cutting Carbide Bandsaw Blade a try and bring the "Happy" back into your Holiday! *Not guaranteed to work if the "Johnson" was Andrew.